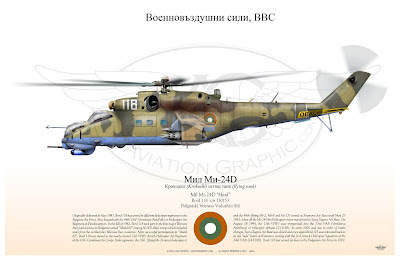 Museum associate Miguel has been working with Aviation Graphic to produce a poster of our Mil Mi-24D Bord 118. The result is a poster suitable for framing as shown below. Miguel and Ivan researched the history of Bord 118 and Miguel provided high-quality photos of Bord 118 to the artist so that the resulting poster is both visually and historically accurate. Originally delivered in May 1981, Bord 118 has served in different helicopter regiments in the Bulgaria Air Force. First housed with the 44th VAP (Vertoleten AvioPolk) or Helicopter Air Regiment at Plovdiv airport. In the fall of 1982, Bord 118 took part in the first major Warsaw Pact joint exercise in Bulgaria named “Shield 82” among 60,000 allied troops which included units from the northern-tier Warsaw Pact countries. After successful participation in “Shield 82”, Bord 118 was moved to the newly created 13th VPBV (Вертолетен полк бойни вертолети) Attack Helicopter Air Regiment of the 10th Combined Air Corps. Both regiments, the 13th (flying Mi-24 attack helicopters) and the 44th (flying Mi-2, Mi-8 and Mi-1) served at Krumovo Air Base until May 27 1983, when all the Mi-24 Hind helicopters were transferred to Stara Zagora Air Base. On August 18 1994, the 13th VPBV was reorganized into the 23rd VAB (Vertoletna AvioBaza) or helicopter airbase (23.VAB). In early 2000 and due to order of battle changes, Stara Zagora Air Base was closed and once again Bord 118 was relocated back to its old “new” home at Krumovo, serving with the 2nd Attack Helicopter Squadron of the 24th VAB (24.HAB) . Bord 118 last served its duty to the Bulgarian Air Force in 2002. The final poster is 12x16 inches and does not have the watermark in the background. The poster will be available soon at the Aviation Graphic website and Museum Store for 11 Euros plus shipping. Check back for the listing if it is not yet shown on-line. Thanks, Miguel! This once, while I was having trouble exploring Vietnam, I somehow found out about the Green Vietnam visa. I must say it was the best thing that happened to me on that trip! Only after I hired their services was I able to explore this beautiful country!